*All songs by Gordon Lightfoot except "Me and Bobby McGee"
I haven't written about this record (it has been out more than a year now, but I didn't discover it until in the Spring of 2018) because I have misgivings about it. I did buy one (after thinking about it for two months) but don't have a turntable so I haven't played it. Yet. What is "interesting" about this record (which is not 180 gram audiophile) is that all songs are credited to Gordon (at least in the intial release copies), but as most of know "Me and Bobby McGee" was written by Kris Kristofferson and Fred Foster, not by Gordon. The record was made for Barnes and Noble by Warner/Rhino and is exclusive to B&N, but I have seen it listed it on Amazon at double the list price, so I think I should include it here on the website, so people know what it is. And it is, after all, an LP of Lightfoot recordings. 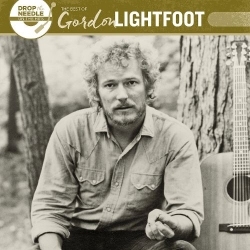 Like the discount CD, "An Introduction to Gordon Lightfoot," this may not be for everyone, since all the songs are available elsewhere and in most cases the exact same recording is available elsewhere (i.e. album vs single), but many fans want to own all recordings regardless of duplication. So, here it is! If you want one, you'll probably want to buy it from Barnes & Noble since copies elsewhere will usually be more expensive. With Barnes and Noble, you may be able to buy it online and pick it up in your local store, which is what I did.